Hammond Model H-40 | MOSweb Online! The H series tone cabinet are designed for use in all types of installations: church, home, school, and entertainment places. Their response is non-directional, with high frequencies projected vertically and the low frequencies horizontal. The tone cabinet contains separate amplifier sections for treble and bass response with cross-over point at 200 cycles. Amplifiers are not interchangeable with amplifiers in other model tone cabinets. 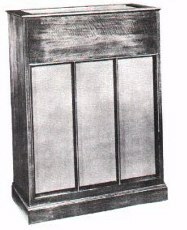 Earlier models of the H series tone cabinet were equipped with separate treble and bass amplifier units. These amplifiers were later consolidated into one unit. For weight of earlier units add 31 pounds to figures below.